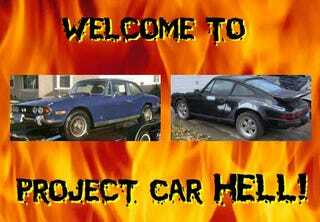 Project Car Hell: Stag or 911? After the $600 pair of Alfettas beat the $800 Fiat by a decisive margin in yesterday's Cheap Italian Edition Choose Your Eternity poll, we figure it's time to set the price of admission in the four-figure range for today's cars. But not very far into four figures, because this is Hell, where wallets are thin and Bondo is thick! Today we've got a couple of incredible steals on fast European machines that would be great fun to drive... if you could get either one to drive, that is. Welcome to Project Car Hell! PCH, Cheap Italian Edition: One X-1/9 or Two Alfettas? Now, when you think about a 70s British car with a V8, you figure it's got to be the good ol' GM/Rover unit, right? Nothing to fear with that well-understood powerplant. However, British Leyland wasn't about to go bolting some engine of colonial origin in their new hot-rod luxury convertible, not when they had an overhead-cam Triumph V8 being knocked together by their loyal workers (between bouts of picket-line duty). That's why this 1971 Triumph Stag comes with three screaming liters of British steel under the hood, and for the shilling-pinching price of just 1500 bucks! Well, maybe this particular car's engine isn't quite up to screaming status; the seller doesn't utter a word about mechanical condition. The seller hasn't looked in the trunk, but swears it "doesnt look like a rusty car by any means," so all you'll need to worry about is every single mechanical component in the vehicle. And the interior. We're not going to lie- even by the standards of British Leyland build quality, the Stag stands out as a particularly trouble-prone car. But if you could get this one working right, you'd have a rare machine that would turn heads and sound great with Cherry Bombs. All right, lovers of German machinery, we know you're shaking your heads in mixed dismay and contempt at those suckaz who think a British car could ever measure up to the painstaking craftsmanship and design prowess of monocle-wearing engineers from Deutschland. Well, peel off your driving gloves and break out every single tool you ever imagined owning, because here's a 1979 Porsche 911 for a never-imagined-possible price of $1600... or best offer! At that price you might reckon it needs some work, and you reckoned correctly. First of all, the seller says the engine smokes, but since it's out of the car you won't know if "smoke" actually refers to "smoke plus chunks of metal spewing from big holes in the case and several cylinders" until it's too late. As for the condition of the body... just remember, it's only 1600 bucks, or maybe less! No mention of condition of interior, brakes, electrical system, suspension, so you gotta figure that stuff might add a few more dollars to the project budget.